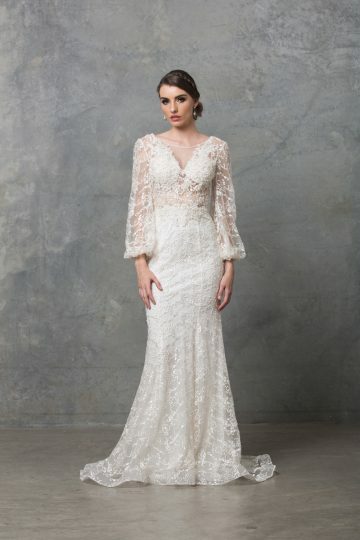 Spanish romance is set in the unique Laurel wedding gown. Featuring a fun and flirty side skirt flounce, lined in organza with layers of soft tulle and lace, you will feel truly ready to tango the night away. Delicately beaded floral lace applique adorns the illusion designed bodice with wide set shoulders extending into mini cap sleeves and a satin band is defined at the waist. Flowing through to a scooped open back, is an invisible center zip for a smooth finish. Add some fun in the Laurel Spanish inspired wedding dress. Featuring a flirty side skirt flounce adorned with pretty floral lace appliques. This dress is perfect for the stand out bride who loves to wear spectacular shoes and get up on the dance floor. The gowns cut and design is flattering to a variety of shapes and sizes (6-24) and comes in 3 unique shades. To identify your size see your nearest Tania Olsen Designs stockist and they will correctly measure you and assist with selecting your size.